The following email went out to all registered Task Force members today. Please take a few minutes to call or send an email to Arnold Randall and voice your opinion about the Cook County, Illinois situation. TOGETHER, we can make a difference! 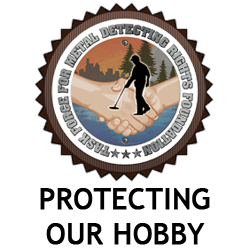 We have a situation in Illinois, where the Cook County Forrest Preserve has decided to ban metal detecting. Local club leaders have requested meetings to discuss fair alternatives but they have been unsuccessful. Please either call or email Arnold Randall and respectfully request that he set a date to meet with the metal detecting community as soon as possible. Below is the email and phone number. We can make a difference if everyone takes two minutes to voice their opinion. copy of letter I sent today. I would request that you schedule an appointment to meet with detectorists to try to come to some agreement on an acceptable alternative to the complete ban of detecting on cook county property. I pay taxes qnd have as much right to use the forwst preserves as anyone else. Some people leave trash all over, are you going to ban everyone from bringing items into the preserves because some people litter? We have a plan for regulating and educating detectorists before.they are allowed to detect. We do alot to increase the beauty of the preserves by removing trash. We also help others locate lost jewlry items free of charge. Please make time to hear us out. Update. Received this forwarded letter today from Pat Anderson, the letters worked. Meeting is set. This is to advise you that the General Superintendent of the Forest Preserve District of Cook County recently has received several requests to meet with various individuals for the purpose of discussing the Forest Preserve District’s current prohibition regarding metal detecting activities in the Forest Preserves. In response, he has scheduled a meeting, to which you are hereby invited to attend, for Tuesday, July 30, 2013 at 2:00 p.m. at 536 North Harlem Avenue in River Forest, Illinois to discuss this issue further. At your earliest convenience, please contact me, Beverly Buckley, at beverly.buckley@cookcountyil.gov to confirm your attendance at this meeting. Thank you for contacting the Forest Preserve District of Cook County regarding this matter. We look forward to seeing you on Tuesday. Any detectorist in the area need to attend. what can we bring? Letters from returned items, examples of items removed while detecitnig, any other positive aspects of the hobby. Thanks Allyson for sharing all these items!